Archimedes was a great mathematician born in Syracuse, Sicily, Italy, in 287 BC. He is revered as one of the three greatest mathematicians of all time alongside Carl Gauss and Sir Isaac Newton. Archimedes focused primarily on the discipline of geometry, and he was also a renowned inventor and engineer. Archimedes’ father, Phidias, was an astronomer of some note, and his family was well off. Therefore, Archimedes was able to become an accomplished musician and poet, and he maintained a lifelong interest in astronomy. 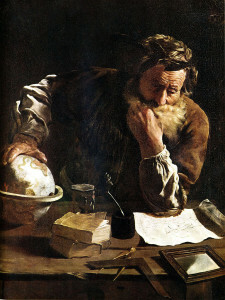 Because of his position, Archimedes was able to travel to Alexandria, Egypt, for his formal education. By all reports, he was thrilled with the lofty intellectual exchanges he had there. Upon completing his studies, he returned to Syracuse to help with his family and to work for King Hiero II as an engineer inventing machines of war and improving the designs of existing ones (most notably the catapult). On his own, Archimedes continued to study geometry and science and the principles of mechanics and made such major contributions to these disciplines as an understanding of specific gravity, hydrostatics, and buoyancy along with ingenious everyday applications of the use of the lever and the pulley. He created formulations for such mathematical accomplishments as a formula to measure the area of a circle. This was done using a system he created called using infinitesimals. This is quite similar to modern day integral calculus. Archimedes also created a formula that enabled him to determine the volume of a solid or the volume of an item of irregular shape. Additionally, he was able to discover the precise value of pi and create a formula for determining the volume of a sphere. His formulas are still in use today. The Claw of Archimedes (also known as the Snatcher, the Ship Shaker or the Iron Hand) was a weapon designed to intercept enemy ships entering the Syracuse harbor, stop them, lift them and topple them into the water. It was an ingenious combination of levers, pulleys, grappling hooks and cable that could be easily operated by one man. In 1999, a successful replica was contrived by scientists for the BBC television program Secrets of the Ancients. The experiment was repeated in 2005 by the Discovery Channel. The Archimedes Screw (also known as the Water Snail) was a device equipped with inner coils like a screw or the interior of a snail shell. Through the use of a crank, the device could pull water up out of the hull of a ship or from a body of water. This device is very useful for moving water into fields for irrigation. The people of the time were excited when they first beheld the Water Snail because it seemed to defy gravity by pulling water uphill. The Archimedes Screw can also be used to move lightweight materials such as sand, grain, ashes and so on. Anecdotal stories about Archimedes paint him as an absentminded professor who did things like dash out of the house naked shouting “Eureka!” (I have found it!) upon discovering the principle of buoyancy while lowering himself into his bath. Of his death in 2012 BC, it is said that Archimedes was busy working out formulas in the sand of his study, completely oblivious to the war raging outside. A Roman soldier entered the study, messing up Archimedes’ drawings in the sand. Archimedes rebuked the soldier, who did not recognize him and ran him through with a sword. This was against the orders of the Roman king, Marcellus who had wanted the great thinker to be spared. Marcellus apologized to and befriended Archimedes’ family members following his death and arranged for a fine burial ceremony and tomb.